Cuttable every 3 LEDs along the cutting marks, according to requirement. the connector between the light strip and ir receiver must be in towards the arrow.Please advise if you have question. 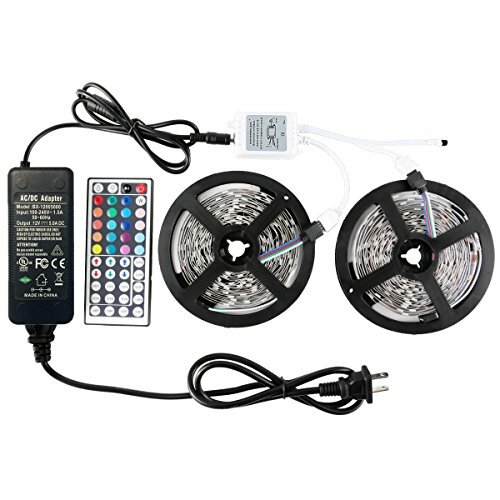 ALL IN ONE KIT(WITH UL CERTIFICATION): Package inluded 2 reels of 16.4ft led lights,AC adaptor,44key IR remote and receiver box. No other accessories are required.We do not recommend to connected more than 32.8ft as the power adapter will exceed limited, and please unroll them for heat dissipation when testing more than 2 minutes. REMOTE CONTROLLER: 44key controller contained a DIY fuction , Press "DIY" botton and then just long press the up/down button,release the button when desired color appear, down button first as it start at white. SATISFACTION GUARANTEED:30-day money-back guarantee for any reason + 12 month warranty for quality-related issues If your product is has a manufacturer defect. Just click GET HELP WITH ORDER under your order ID. Our customer service team would be more than happy to assist you fix the issue. If you have any questions about this product by WenTop, contact us by completing and submitting the form below. If you are looking for a specif part number, please include it with your message.